Air Fryer Chicken Nugget Recipe | Easy Air Fryer Recipe! 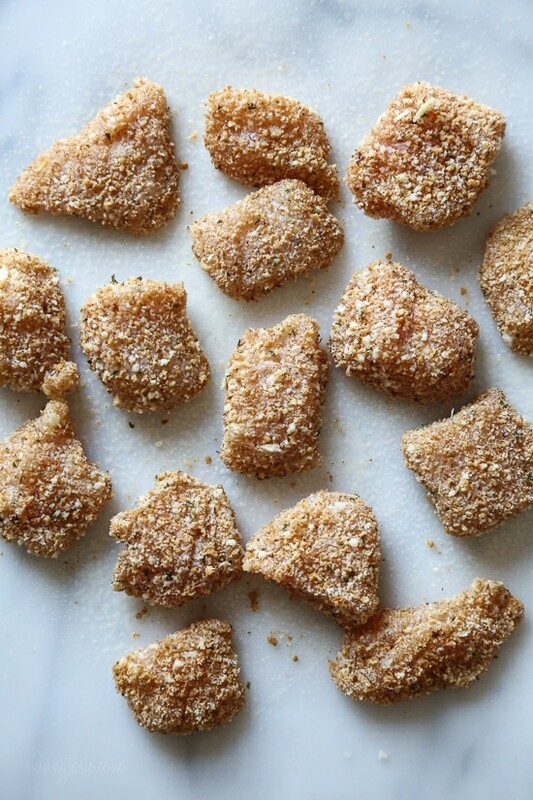 Homemade chicken nuggets made with chicken breast chunks coated in breadcrumbs & parmesan cheese. Fried until crisp, golden and delicious, your family will love this easy air fryer recipe! Making homemade Chicken Nuggets in the air-fryer is so much healthier than fast food or frozen nuggets, and so easy to make. Made with chunks of chicken breasts coated in breadcrumbs and parmesan cheese then air fried until golden and crisp. These also happen to be egg-free, so they are also great for kids with egg allergies. 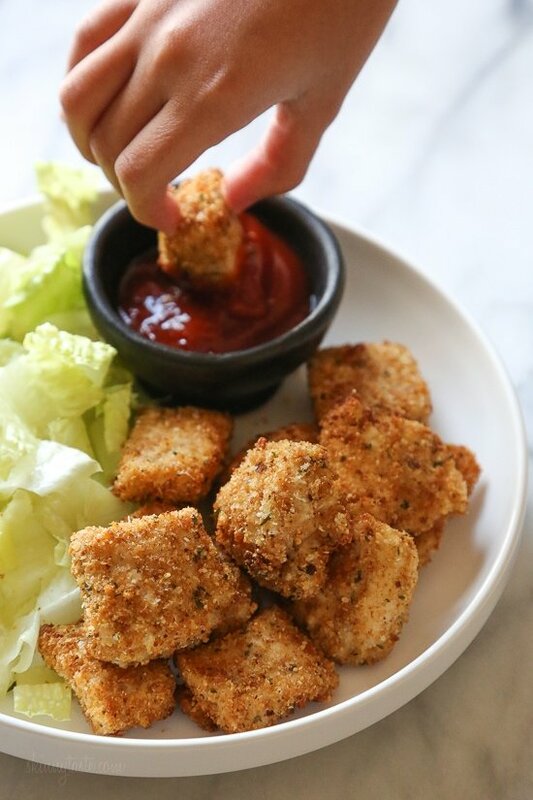 Chicken nuggets are the ultimate kid friendly finger food! But adults love them too. In fact, I was super happy to test out my original oven Baked Chicken Nugget Recipe in my air-fryer (Skinnytaste Vremi Air Fryer that you can pre-order now, it comes out early May!) The results came out excellent in the air fryer, they were crispier and took half the time. Whichever way you make them, they will still taste great. 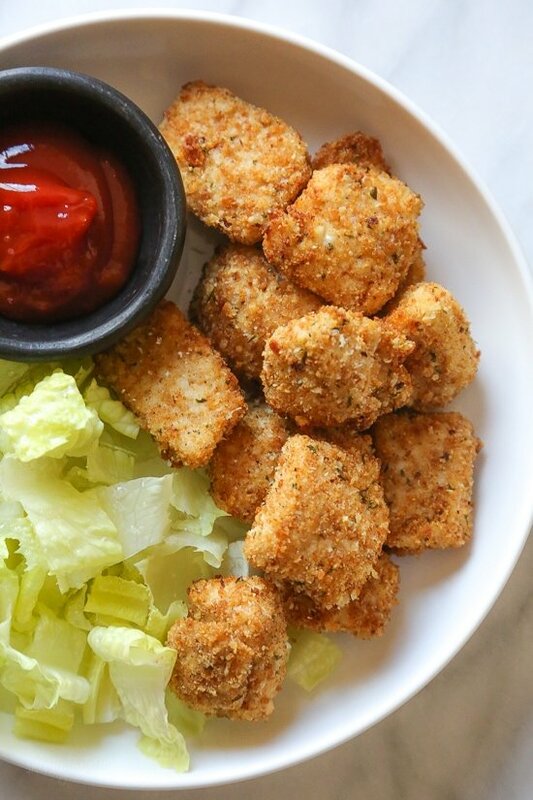 What can be more kid-friendly than chicken nuggets, even the pickiest kids like them! Serve them with ketchup, BBQ sauce or whatever you like to dip your nuggets into. Adults love them too! I like to serve them with lemon wedges and a crisp green salad for lunch. An air fryer is a counter top kitchen appliance that cooks by circulating hot air around food with a mechanical fan at high speed, cooking the food and producing a crispy layer similar to frying, but without all the oil. Traditional frying cooks by completely submerging foods in hot oil. The air fryer works alternatively by coating food in a thin layer of oil while circulating air heated up cooks foods like potato chips, chicken, fish, pork chops, french fries or even baked goods, with 70% and 80% less oil than a traditional deep-fryer. Start with organic chicken, when possible. Trim any excess fat and cut the chicken into equal bite-sized pieces. Preheat the air fryer to 400F. Don’t overcrowd the air fryer basket, cook them in batches as needed. Spray the chicken lightly with oil to get a golden crust. Turn the chicken half way, the bottom browns more than the top. This will ensure even, golden cooking on both sides. If you’re serving everything at the same time and cooking in batches, you can add everything back into the basket once it cooks and heat 1 more minute so everything comes out hot at the same time. Making homemade Chicken Nuggets in the air-fryer is so much healthier than fast food or frozen nuggets, and so easy to make. Preheat air fryer to 400°F for 8 minutes. Put a few chunks of chicken at a time into the breadcrumb mixture to coat, then on the basket. Lightly spray the top with olive oil spray then air fry 8 minutes, turning halfway. Until golden. We made these tonight and they turned out AMAZING. My toddler who has a pretty limited diet for medical reasons absolutely loves them, thank you! The only change I made was to soak the meat in low-fat buttermilk instead of olive oil to increase the caloric intake for my daughter, and they came out so tender. This will be a regular addition to our weekly menu. I am trying this tonight but I realized I bought “traditional Panko bread crumbs” and don’t have Panko by itself. Do you think it’ll be fine? This recipe came out perfectly! My air fryer doesn’t go to 400 but 390 for 8 minutes made the most perfectly crispy nuggets. The inside was white and juicy. I’ll never buy chicken nuggets again! *We are on a dairy free diet, but I mixed Mrs. Dash chicken seasoning into the panko mix. I put the ingredients in the WW recipe builder and came up with 2 points per serving. Am I missing something? I can’t get enough of these nuggets. Very very good. I made this tonight – so good! My little kids are still skeptical but my 12yo liked them so that is a win to me! Oh wow! These are nothing like the frozen nuggets or the fast food nuggets. These are so good, I was amazed it was chicken. We loved them and will definitely have them again. And again. And again! Thanks for the recipe!!!! So good! We didn’t have Italian breadcrumbs, so used Italian seasoning with our Panko. Have a tiny Dash air fryer and love it. Made some Greek yogurt ranch from SkinnyMS to go with. Soooo good! Any experience with the cuisine art air fryer convention/toaster oven? I seem to be burning everything in it! Or it’s burning outside and under cooked in inside. These turned out great. We followed the recipe exactly as it says. We will definitely make these again! I suppose if you did tenders rather than nuggets as long as they were still total 4 oz? 3 FS points? Oops, sorry, I forgot to put my rating. Just made these for dinner tonight for my husband and myself. They were quick, easy and delicious. Had enough for our lunches tomorrow, his a wrap, mine in a salad. Just made the air fried chicken nuggets. They were really great tasting! But I do have a question. How do get the breadcrumbs to stick to the chicken? The crumbs did stick in some spots, but not the whole nugget. I followed the recipe exactly. What else can I do? Thanks. Gina, love all that you do. Was going to make these for a party this weekend and realize that it will take several batches (making 4lbs of chicken). You think making them ahead of time, putting them in the fridge and then reheating at 350 will ruin the coating? Wondering if, for this application, I should just use the oven method. Thanks! I think I would use the oven, sorry for the late reply! Delish! But I don’t care for cracker crumbs, so I used 12 reduced fat “Ritz” crackers (12=5sp) which made about 1/3 cup, crushed up, for my breading. So good! Made wraps, then used the chicken for salad the next day. I meant I didn’t care for bread crumbs so I used cracker crumbs! But I can’t edit the post now. Sorry. Looking for an air fryer. Just converted to the instapot (not here yet). Which is the best air fryer? This was amazing! Kids and i ate it and everyone loved it. Love this! Thank you! I didn’t know that you had an air fryer recipe, so I was going off of the original recipe and winging it in my air fryer. I was just getting on here to leave a comment on the original recipe to do 400* for 8 minutes and that’s exactly what your air fryer directions say! I felt pretty good about myself!And I think they turned out even better, juicer from the air fryer! Made these tonight for dinner. 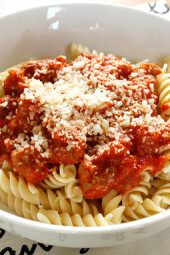 So good and supper easy! Aldi’s’ has them but not all the time. You have to watch. What brand whole wheat breadcrumbs do you use and where do you get them? My store doesn’t have any. Asiago of parm cheese. The amounts you add are to your taste. store in a airtight container. Any Bread works, its your preference. I’ve never heard of an air fryer before, but it sounds like an appliance I want! I’m all about cooking things in a healthy way. Thanks for sharing this post. I’m going to save it to share with my Facebook audience soon. How long do you normally cook them on each side? I am confused as to what purpose the baking sheet plays in this recipe. Is that just a “leftover” from the oven-baked chicken nuggets recipe? If not, I guess I’m not getting it. Ugh, thanks for catching that! I just fixed. That’s a bit from the original oven recipe that she forgot to edit out in the air fryer directions. Gina I have the farberware airfryer 2 pound. Can the recipe be adjusted for my fryer? Do you think you could use this recipe using tofu as the protein? Hi Gina! How many quartz do you recommend for an air fryer? Thanks! I have a 3 qt. I bough the bigger one expecting to have double the size, but it was only slightly wider, and instead deeper which doesn’t really work for me so I returned it. Gina, Macy’s has a great kitchen sale today and I am debating between the NuWave Brio 3 qt and 6qt. Is the 6 qt. the one you are referring to above as not really wider just deeper? Since stacking items doesn’t seem best, I am guessing the bigger size would only be beneficial if you were planning to cook bigger items like a whole chicken. Does that seem accurate based on your experience? Yes, I like the 3 qt better. The 6 is deeper, but that doesn’t really help. How many pieces are in a serving on average ? These look so yummy!! Depends on how small you cut them. Basically 1/2 chicken breast. We made chicken wings yesterday, and OMG. They were PERFECTLY crispy on the outside and juicy and tender on the inside…WHAT!!! I am totally sold on trying EVERYTHING on this air fryer!! Chicken breasts + panko bread crumbs never seems to get crispy enough in the oven, and just gets BLEGH in a pan with oil….but the air fryer!? OH YES! 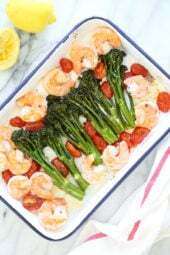 This will definitely be my next recipe! Can these be frozen and reheated?! I haven’t tried but I am sure you can. 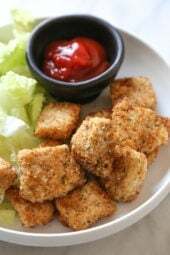 I’ve done basically this same recipe and ‘fried’ the raw, frozen, breaded nuggets with great results! I received an air fryer for Christmas and am so happy that you are starting to do more air fryer recipes!!! I got an air fryer for christmas. I’ll have to try this out! 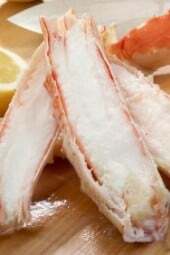 I would love to try this recipe, what brand air fryer do you recommend? I have the Nuwave Brio, I linked to it above. Can I ask what size you have? Love the air fryer recipes! Can’t wait to try this one!